Fleet of Flowers, taken by Innah Fae Milburn in 1948; submitted by her great-granddaughter Sue Stutzman. 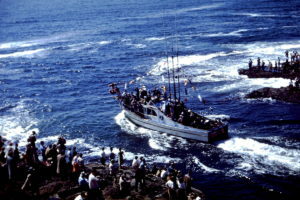 On Memorial Day, each year since 1945, Depoe Bay has hosted the Fleet of Flowers. 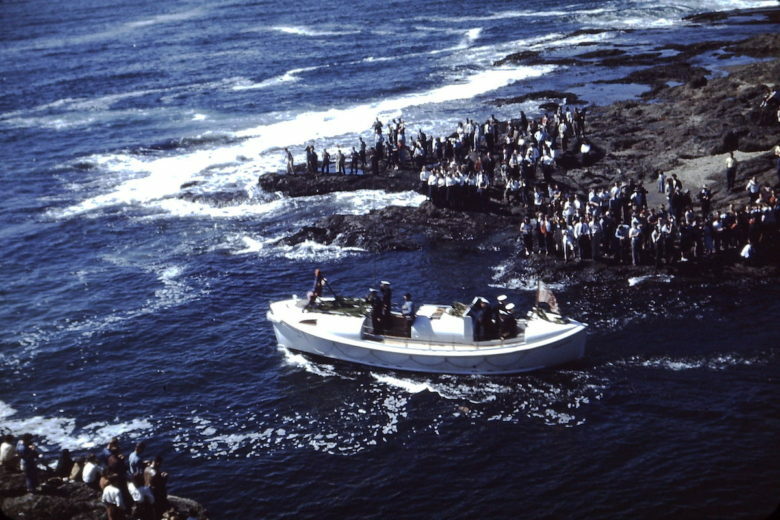 The event was initiated to honor the memories of two fishermen, Roy Bower and John Chambers, who died at sea in an attempt to aid another fisherman. Following an on-shore ceremony at Depoe Bay Harbor, the fleet of flower-laden boats pass under the Highway 101 bridge. I didn’t become aware of the Fleet of Flowers until I started taking tour groups there in the mid-60s. I had no idea people used to go down to the water because I didn’t go there before the sea wall was already in. Photo of the Depoe Bay seawall taken sometime after 1952 (though I doubt there would have been many people standing down there on a surf day such as this one). 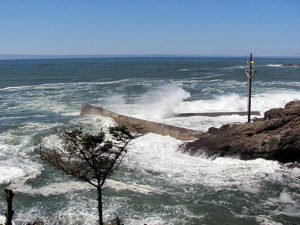 Oregon’s Most Endangered Places . . .